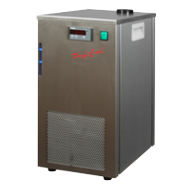 What is a recirculating chiller ? 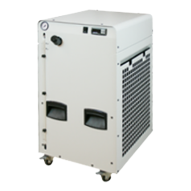 National Lab recirculating chillers are compact, ready-to-install units for cooling liquids within a circuit. The liquid used is generally water with or without additives and is called a cooling medium on account of its function. 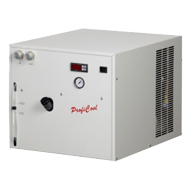 A recirculating chiller essentially consists of a hydraulic part (with heat exchanger, water tank and pump), which is intended to substitute a mains water circuit, and a cooling part. Heat generated by machinery or equipment is transported via the hydraulic components by pumping the cooling medium through the applications to be cooled. This method largely uses ambient air. 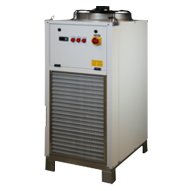 The heat exchanger in the chiller is therefore a water/air heat exchanger. The nature of the process means that the temperature of the cooling medium cannot be cooled below the temperature of the air. In an active cooling unit the heat exchanger in the chiller is a refrigerant condenser. Temperatures for the cooling medium of -10°C to +20°C can be achieved independently of the surroundings. 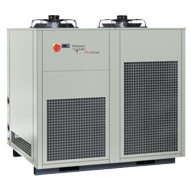 One feature applies for all cooling options, namely that, when matched with the hydraulic components, they represent a ready-to-install and fully equipped cooling unit. 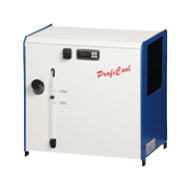 A cooling circuit is thus created without any loss of cooling medium. Apart from the fact that it conserves water resources, the main advantage of a recirculating chiller lies in the fact that constant conditions (temperature, pressure, etc.) are always present for the application to be cooled and there is no gradual impairment of the cooling properties by the permanent precipitation of minerals from fresh water.